History comes alive in this incredible children's illustrated book about castles. Slicing through different areas of a medieval fortress, extraordinary views reveal the people busy inside, and preparing for battle as an enemy army approaches. Packed with facts, you'll find out what it takes to build a massive 14th-century castle, dress a knight in armour, or prepare a feast fit for a king or queen. From the drawbridge to the dungeon, Cross-sections Castle swarms with the people who keep the castle ticking over - the workers, craftsmen, and servants. And, as you pore over every page, look out for the villainous spy. Is he in the well... the keep... the moat? No? Keep looking, he's there somewhere!Back in print after 20 years, you can cheer on jousters, be entertained by a troubadour, and witness the gory details of a traitor's demise. This unique illustrated book for kids is not just the story of a castle - it brings medieval history to life.History comes alive in this incredible children's illustrated book about castles. Slicing through different areas of a medieval fortress, extraordinary views reveal the people busy inside, and preparing for battle as an enemy army approaches. Packed with facts, you'll find out what it takes to build a massive 14th-century castle, dress a knight in armour, or prepare a feast fit for a king or queen. From the drawbridge to the dungeon, Cross-sections Castle swarms with the people who keep the castle ticking over - the workers, craftsmen, and servants. And, as you pore over every page, look out for the villainous spy. Is he in the well... the keep... the moat? No? Keep looking, he's there somewhere!Back in print after 20 years, you can cheer on jousters, be entertained by a troubadour, and witness the gory details of a traitor's demise. 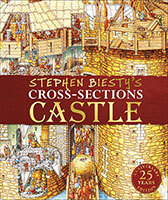 This unique illustrated book for kids is not just the story of a castle - it brings medieval history to life.